The Hunley was the first combat submarine to sink a warship, in 1864. It was very basic, being designed for a crew of eight, seven to turn the hand-cranked propeller and one to steer and direct the boat. Its discovery in 1995 was described by the Director of Naval History at the Naval Historical Center as “probably the most important find of the century.” ‘Tens of thousands’ attended an official funeral in Charleston, South Carolina in 2004, including all five branches of the U.S. armed forces. 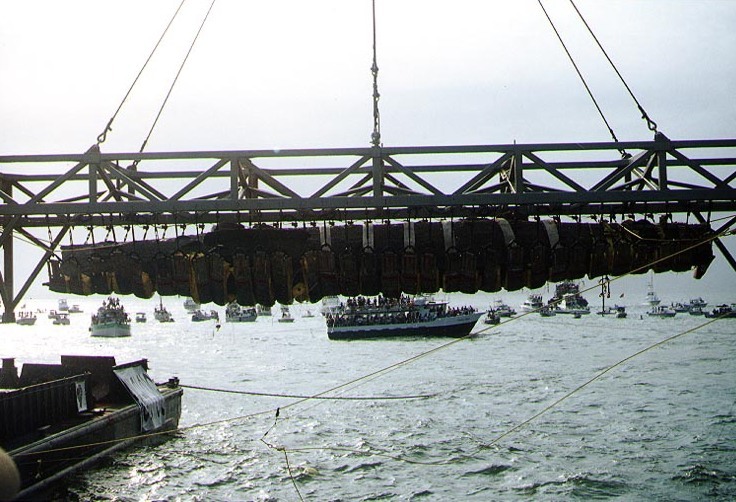 A full 22 years after their bodies were discovered, scientists have come up with an explanation for the mysterious deaths of the crew of the Civil War submarine the H. L. Hunley 150 years ago, reports the IB Times. The Confederate crew of eight were found seated in their stations on the hand crank that powered the ship. They showed no sign of struggle or trying to escape. They also displayed no sign of physical injury. The bilge pumps hadn’t been used and they hadn’t tried to escape through the air hatches. The submarine was only discovered in 1995, found lying about 300 metres from where the Housatonic came to rest. It was retrieved from the seafloor in 2000. For decades, no one has had any idea how the crew died. But researchers at Duke University now say that the crew were killed instantly from the force of a torpedo blast, publishing their findings according to research published in the journal PLOS ONE. When the submarine was opened up, the bodies of the eight men were discovered in their puzzling apparent peace. Scientists now believe that they died on 17 February 1864, the instant they rammed a torpedo into the hull of the Union ship Housatonic, using a total of 61kg of black powder. ibtimes doesn’t like my ad blocker. On August 29, 1863, The Hunley’s new crew was preparing to make a test dive, when Lieutenant Payne accidentally stepped on the lever controlling the sub’s diving planes as she was running on the surface. This caused the Hunley to dive with her hatches still open. Payne and two others escaped, but the other five crewmen drowned. I remember reading about the hunt to find the Hunley in Clive Cussler’s The Sea Hunters (Cussler has done two of these books, interesting reads and his enthusiasm for hunting relics of the past is effervescent and some of the expeditions end up in his novels). The next time a ship was sunk by a sub was WW1.